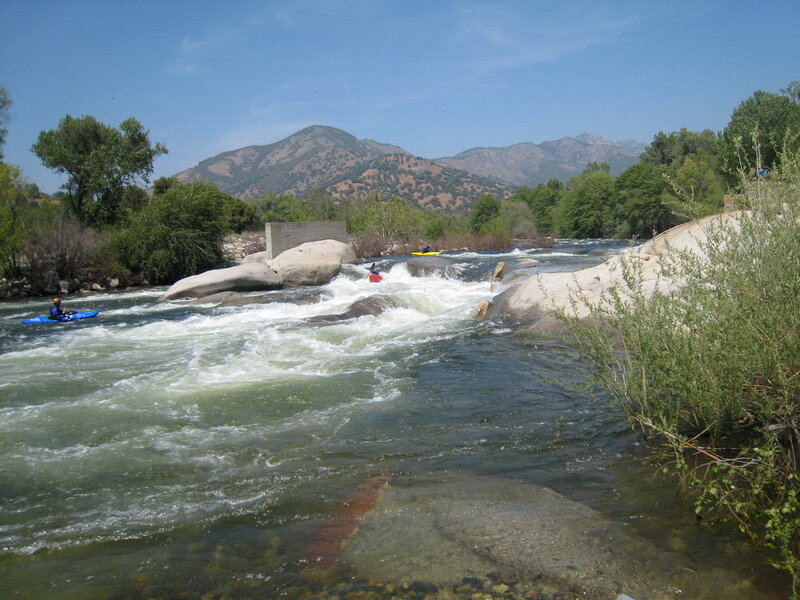 The Kaweah is one of my favorite rivers in California. 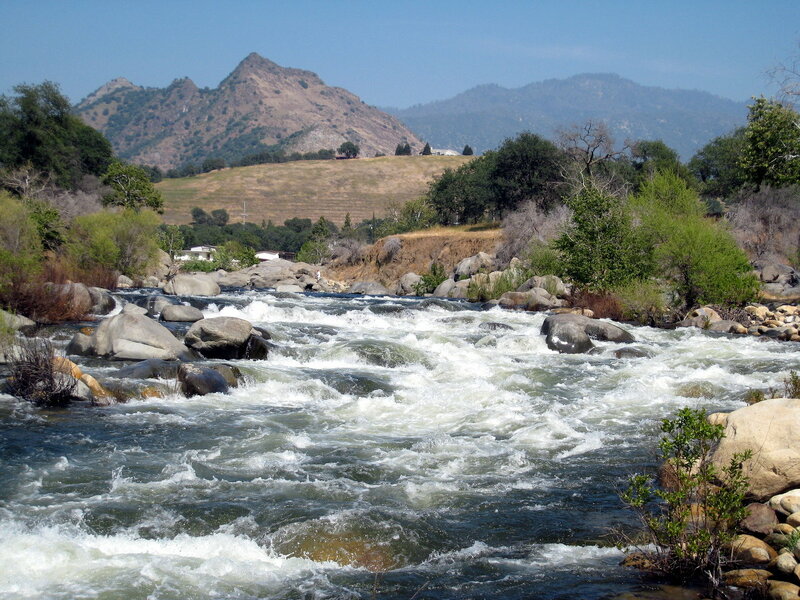 It is a refreshing change from more-northerly snowmelt standards like the North Fork Yuba, North Fork American, and Merced. For south bay residents, the drive is surprisingly short. You find many excellent rapids in a short distance, including long boulder slaloms and tricky hydraulics in granite bedrock. Scenery is good despite the semi-urban setting, and the town of Three Rivers has a variety of good restaurants. Around the turn of the century, when barbed wire was installed at Gateway Bridge, and parking was prohibited near Dinely Bridge, there were severe access problems on this run. Most of the land along the river is private property. The situation improved greatly in 2005 when rafters acquired Three Rivers Hideaway, an RV park and motel with attached campground that is like a miniature Camp Lotus on the South Fork American: nice. Phone 559-561-4413. 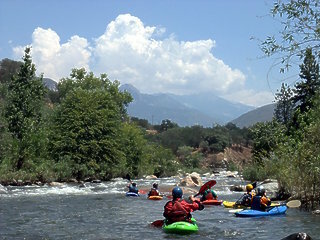 Kayaker rate $5 per person per night (2010). Here are suggestions for Saturday and Sunday runs using the Three Rivers Hideaway campground as base. 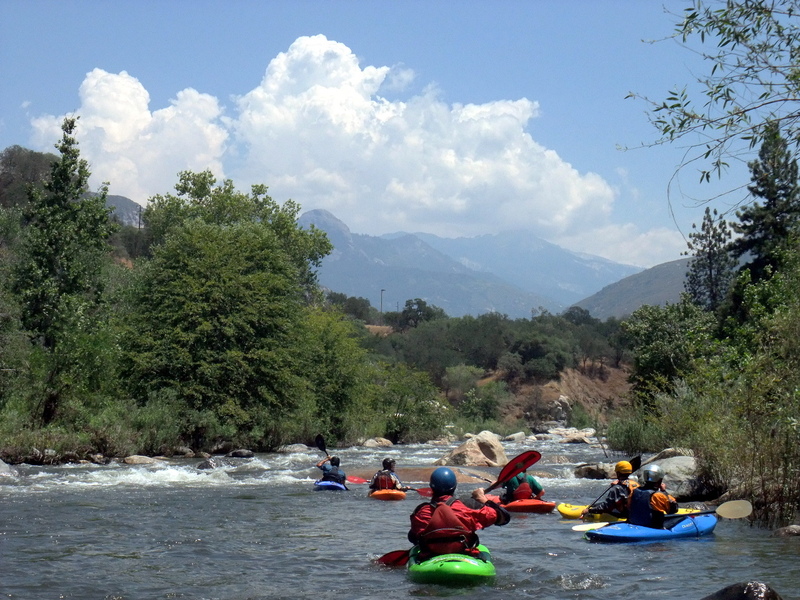 Saturday, class IV: Kayakers can ask campground operators for permission to start at the commercial put-in, provided they don't interfere with rafting groups. Powerhouse might be considered class V, but can be sneaked on the left. Especially in early season, continue all the way to Terminus reservoir. In later season or big water years, the best rapid could be underwater, so you might want to take out at the North Fork Road bridge. 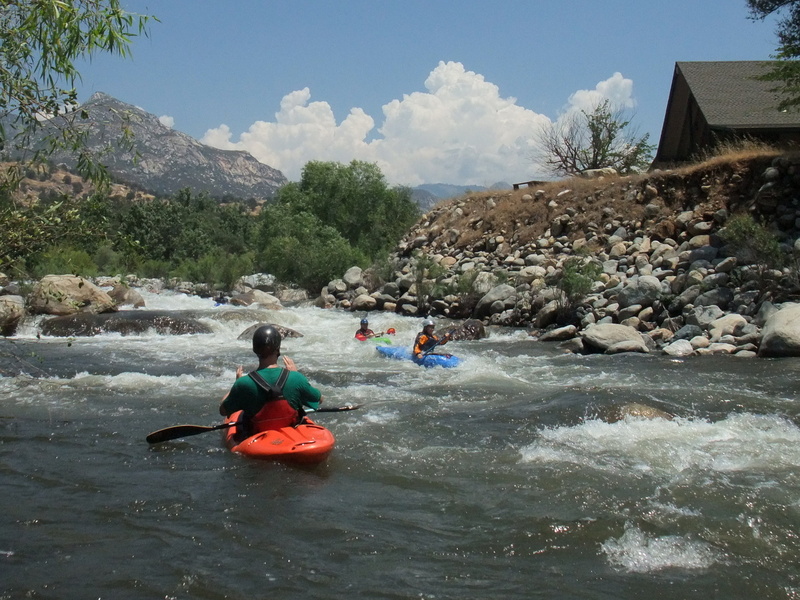 Sunday, class IV+: With shuttle person, drive uphill within sight of the National Park toll booth, drop off boats, say goodbye to your shuttle driver, walk your boats downhill .2 mile, cross the river on a bridge, and put in on the left bank. Several IV+ drops and one possible portage occur in the 170 fpm .6 mile before the East Fork confluence. 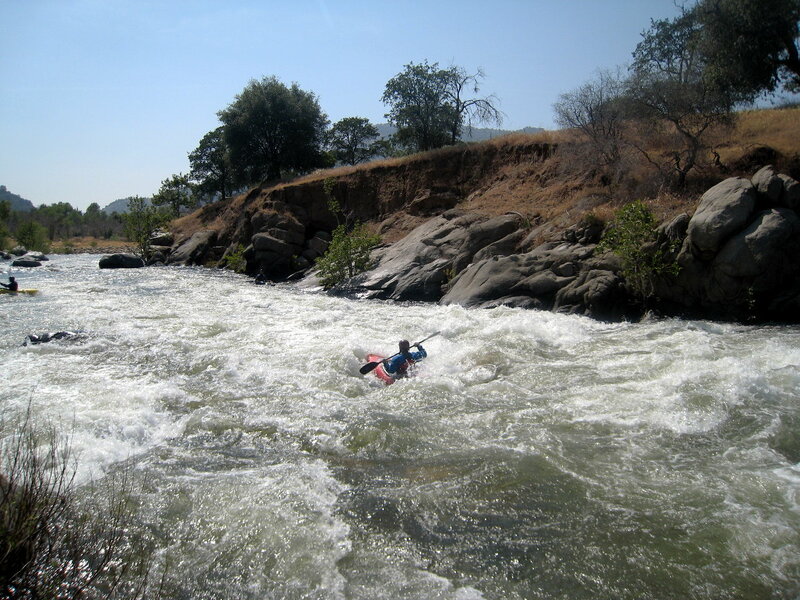 Gradient eases after the confluence, but some difficult rapids remain before you reach the commercial put-in. Continue as before but possibly take out below the Slickies to conserve time for your drive home. 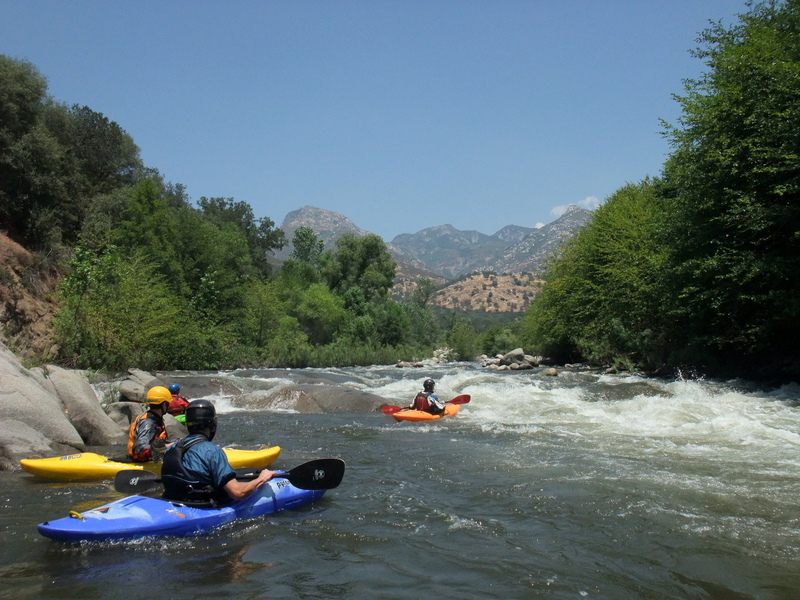 There are only three practical put-ins for the Kaweah: the Sequoia park boundary, the commercial rafting put-in, and the Three Rivers Hideaway campground. You could put in at Dinely bridge but parking is distant and the campground is shortly below. Although most guidebooks start their mile-by-mile descriptions at the East Fork, it is no longer possible to put in at the highway bridge just below there, due to barbed wire and a no-parking zone. So this guide shows mileage starting at the Sequoia park boundary, continuing parenthesized after the commercial rafting put-in. Take-outs are plentiful. 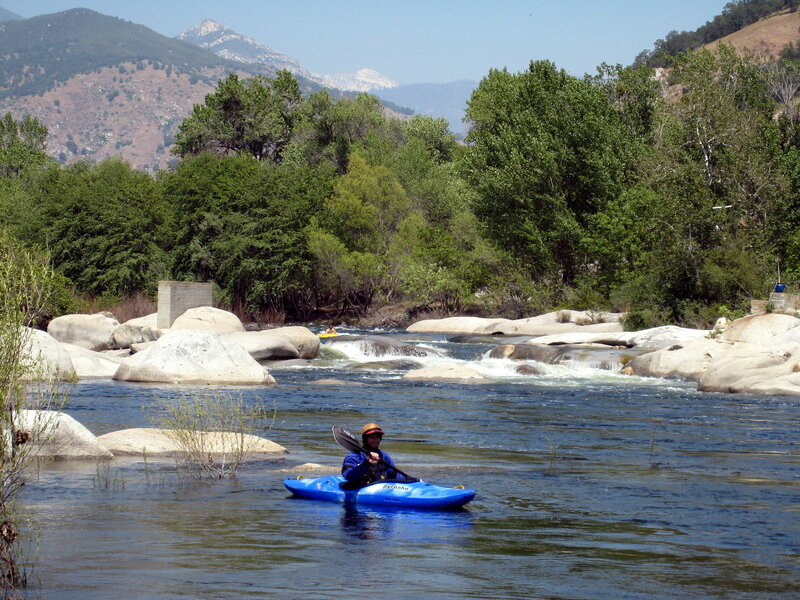 For a short day you could take out at the Three Rivers Hideaway campground. A more typical take-out is near the Chevron station just below the Slickies, or on the right at the North Fork Road bridge. For a satisfying long day you can go all the way to the reservoir. 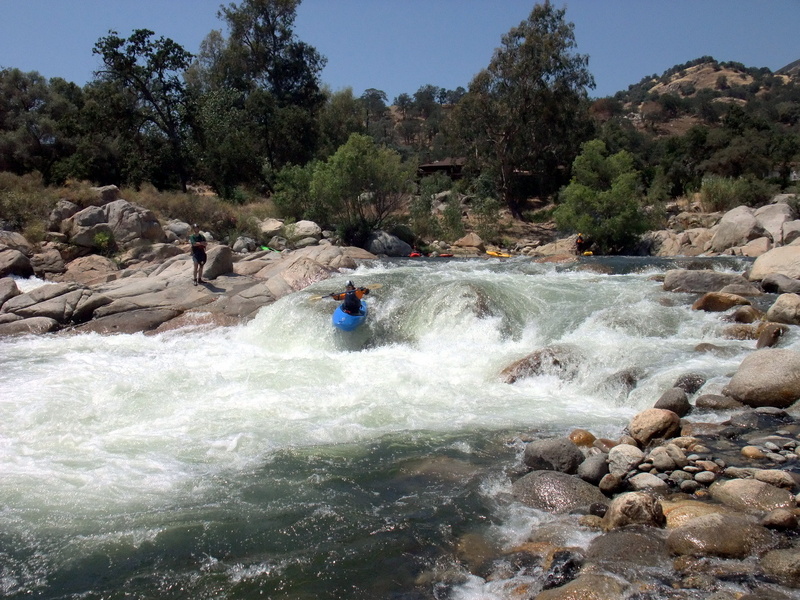 The rapids above the reservoir are great fun, and in early season or drought years, moving water continues almost all the way to the upper reservoir access. The rapids below the East Fork are mostly boulder piles, so they can change from year to year, especially after large flood events. 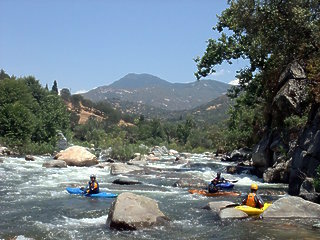 For detailed information about all forks of the Kaweah, see Bill Pooley's Kaweah River website. Put in at or above the SCE bridge across the River Kaweah. The 1st rapid below SCE plant #3 is a very steep class IV, all white. 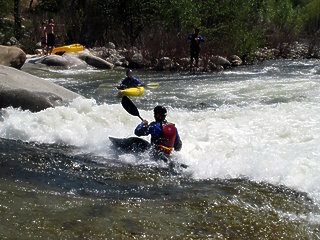 The 2nd rapid starts at a weir dam and ends with a class IV right turn. The next two are just class III. The 5th is a 2 meter falls best run on the right, class IV. 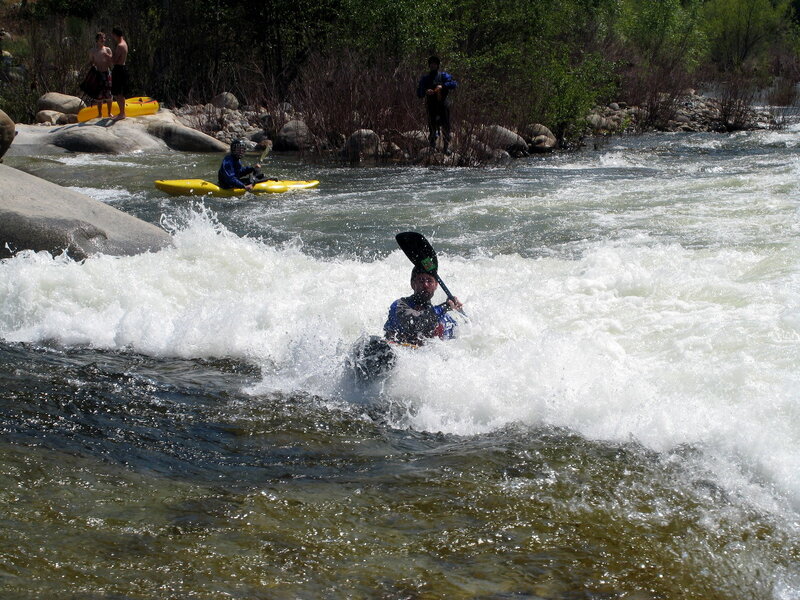 The 6th is a class V- usually run on the left at higher flows, or the right at lower flows; possible portage on the right. This is followed by a class II+ rapid. The 8th is a class IV- double drop. The 9th is a class III bedrock slide. The 10th is a class III where a brown house on the right bank marks a scout/portage below. The 11th is a badly undercut class V+ drop often portaged on the left. The 12th, within sight of Gateway bridge, is a class IV pour-over. The 13th follows closely, a complicated class IV+ S-turn. The 14th and 15th are class III boulder drops that take you to the right under the bridge. East Fork of the Kaweah enters on the left. Gateway bridge, also called Pumpkin Hollow bridge. Afterwards, gradient tapers off to 120 fpm for the first mile, then 92 fpm. 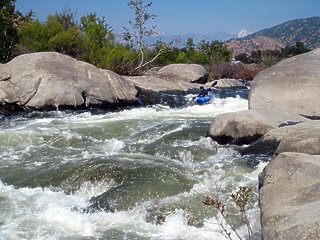 Several difficult rapids occur, but pools between are longer than above the East Fork confluence. Gateway, class IV, a steep boulder slalom shortly below the bridge. The Chute, class III+, an overall one-meter drop into a big hole. Headwall, class III, boulders ending at a highway retaining wall. Osterizer, class IV+, a long and steep boulder field with pushy water. Scout on the left. Enter left or right, with a recommended route exiting on the left, although routes on the right are also possible. Commercial raft put-in, in the midst of an unnamed class III- rapid. Prozac, AKA Willows, class IV-, a long but not very steep boulder garden. Rafts often enter right of an island, work center to avoid a large hole, and finish on the left. Paxil, AKA Krishna, class III, a short steep rapid ending at a rock wall on the right. It looks a lot like Lithium but is easier. Zoloft, AKA Riverway, class III, big ledge holes at the bottom along the highway. Lithium, AKA Bumper, class IV, steep drop with sticky holes through big boulders. From the bottom this rapid seems impossible, but it must be easier than it looks. Hammer, class III, moderate whitewater most of the way to Triple Treat. Triple Treat, class III, formerly three channels, perhaps now changed. Powerhouse, class V- middle, class IV left, high-water right. Island scout. Recognition: rocky drop with power lines and stone building on the left. 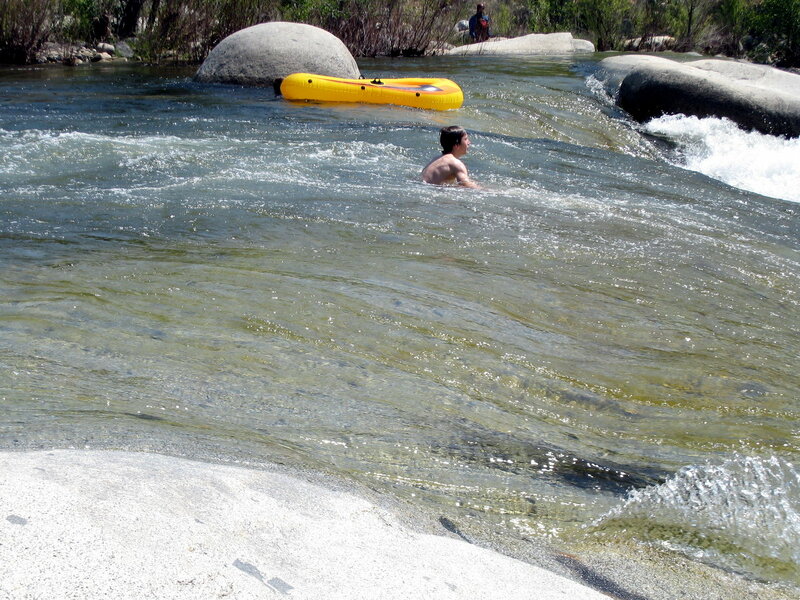 The center channel should be rated class V- especially at low flows when entrapment rocks come into play. Willow-choked sneak route on the far left. At high flows the right channel provides another class IV sneak route. 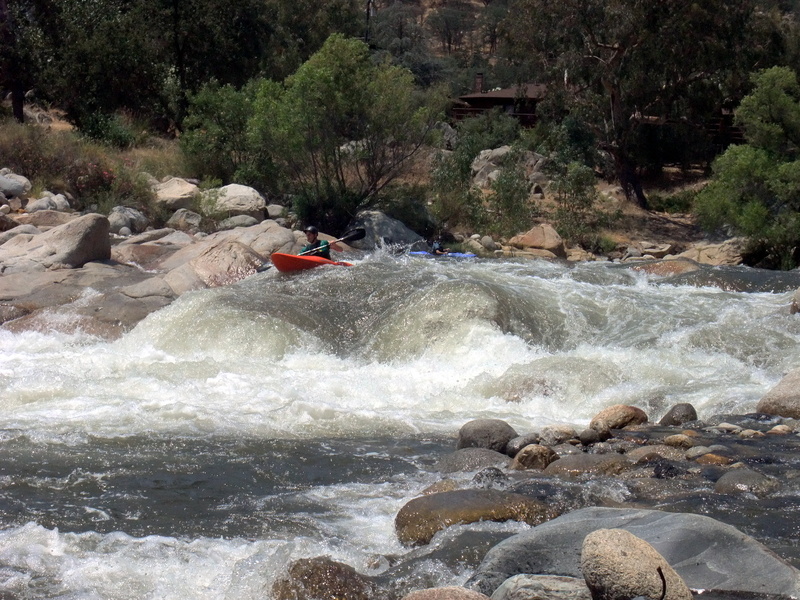 Cyanotic, class IV+, a long and complicated rapid with many possible routes. Difficult scout on the left, or top-only view on the right. Big hydraulics on the left, and many boulders (or sieves) on the right. 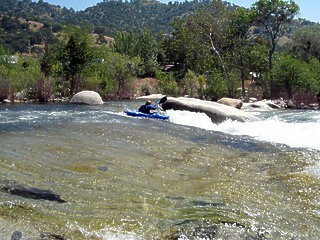 Lower flows give you an opportunity to eddy hop down the left side. At most flows the best exit slants from left to right. In this section the river often divides into left and right channels. If you run the river more than once, stay left one time and right another. Generally both left and right channels are runnable, with enough water. Some of the narrow-channel drops are totally unique and intriguing. The rapids changed in the 1997 flood and will likely change again. Elowin, class III-, a series of bedrock-based drops just above the bridge. Dinely bridge, with gauge on the left bank below. Dinely bridge rapid, class III. Toilet Bowl, AKA Basura Blanca, class III, swirling water on the right over bedrock drops (hence the name), a big boulder bar in the center, and a small channel on the left leading to the campground beach. Also called Ender Hole, auto-ender between .5' and .6' on the gauge. Hideaway Campground on left, at low flows visible as a gravel beach. If you camp at Three Rivers Hideaway, they may give you the access code to open the gate for river access at the commercial raft put-in. Stony Broke, AKA Cat Eye, maybe class III, multiple changing channels. Big Rock, AKA Dislocation, maybe class III, with 20' monolith on the left. Ditch Now, class III+, a steep rock garden, routes right and left, with sticky holes near the bottom. Suicide Falls (class IV) can be sneaked on the far right or left, depending on flows, although most people prefer the center falls. The middle of Suicide Falls is a frowning hole, seemingly not a keeper, although right or left boofs, if properly executed, seem lower risk. A small recovery pool follows, with moving water accelerating as flows increase. 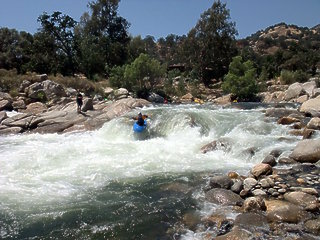 The Chair, class III+, a very deep hole, especially at low flows. If approached with anticipation it is semi-avoidable, although the swim or roll isn't bad because of the long pool that follows. 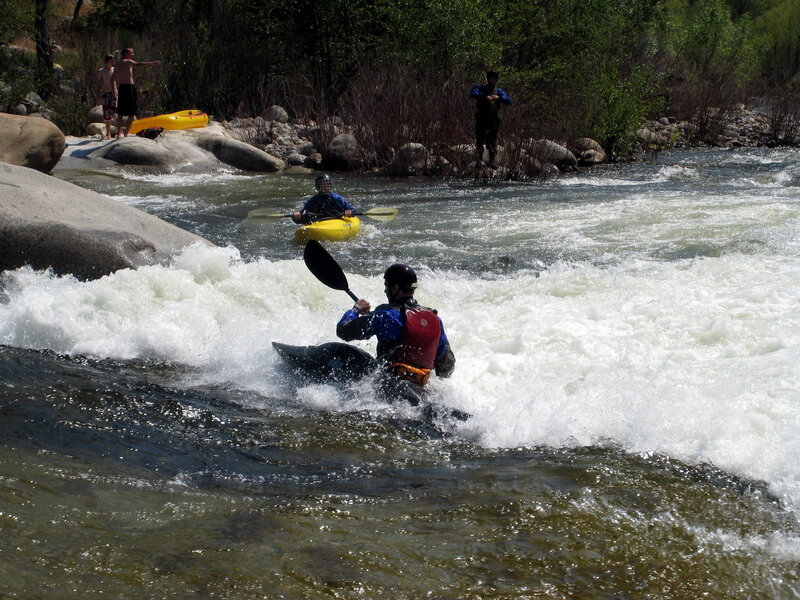 A long stretch of easy whitewater ensues. The North Fork Kaweah enters on the right, obscured by an island. 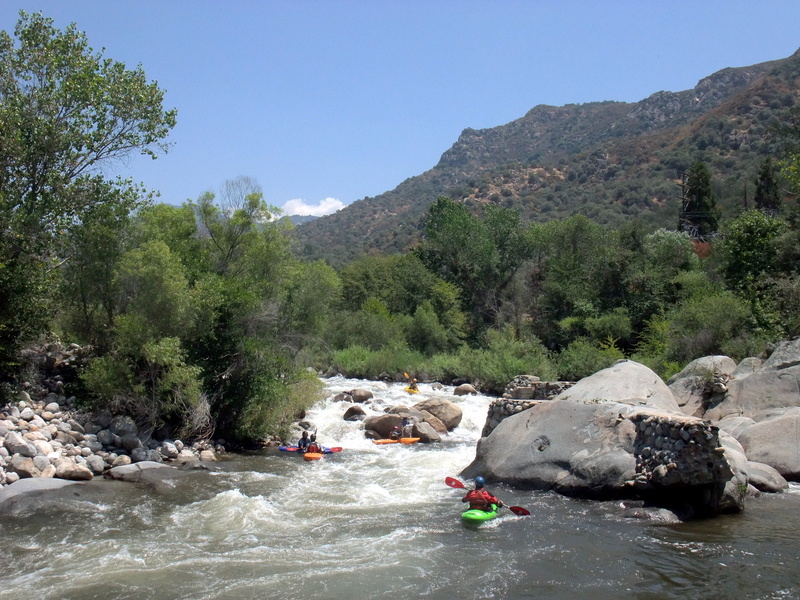 It is worth paddling upstream to see its final drops over granite bedrock. See this description for an run upstream on the North Fork. and this description for an run way upstream within Sequoia park. The Ledges, AKA Upper Slicky, class IV, with two channels around midstream bedrock at most flows. The right channel has a now-plugged undercut on the right, with an interesting cross-river diagonal move. The left channel is narrow but a bit easier. 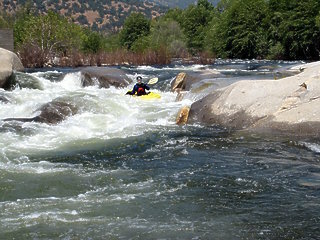 The Slickies, AKA Lower Slicky, class IV-V, a bedrock slide into a large riverwide hole that becomes a keeper at high flows. This is an unusual rapid, with a shallow granite slide on the right and a bruiser vortex just to the left. The hole feeds slowly leftwards. You must boat precisely to hit the line just to the right of the vortex. At flows above 1000 or so, a sliding granite falls on the far left offers a sneak route, increasingly advisable as flows increase. North Fork bridge, take-out legal on the right, but a long carry. 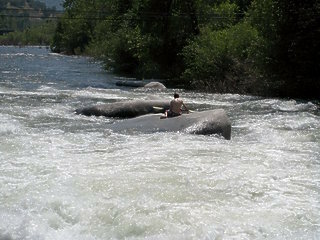 Rapids taper off suddenly at the North Fork Road bridge. Scenery remains good for a while, then worsens after the South Fork confluence. Tuber's Religion, class III-, two large holes in the middle, followed by a tree growing in the river. Golf Course, class III-, rocks and big waves (at high water) near hole 6 of the Three Rivers golf course. Tunnel of Love, class III, so named because of trees growing overhead. 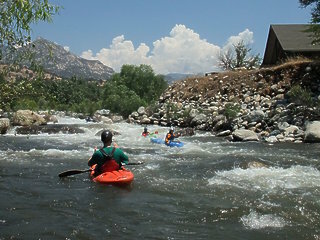 The route with most action is the left channel at the KOA campground. 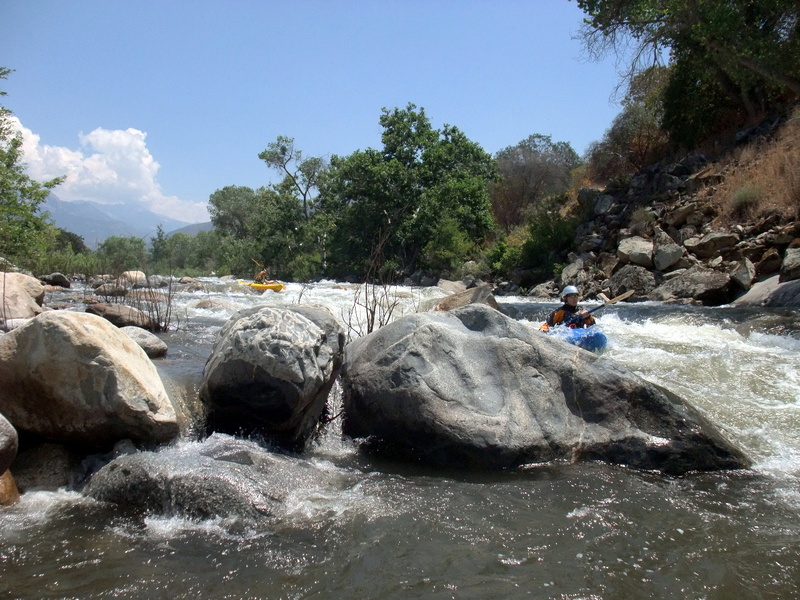 The right channel is usually runnable with two notable rapids. 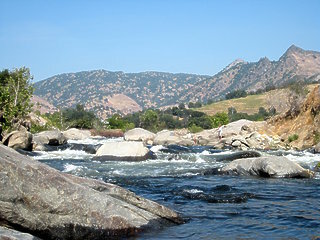 South Fork of the Kaweah enters on the left, usually without much water except after a rainstorm. Upper Holiday, AKA Washing Machine, class IV, possibly scout right. Pushy entrance on the right, transitioning to a straight-away with big waves and a large hole in the center. Sneak route on the left is more passable as flows increase, but avoids only the entrance. At the base of this rapid, a public trail leads back to the highway, making a good take-out for kayaks when the reservoir is near full. Lower Holiday, AKA Rinse Cycle, class IV-, possibly scout left. A rock-infested section with the cleanest route on the left, followed by big waves in the center. Minor rapids follow when the reservoir is low. Boat ramp on the left, a take-out that usually involves a bit of flatwater paddling across the reservoir. This is easier than carrying boats to the highway, however. 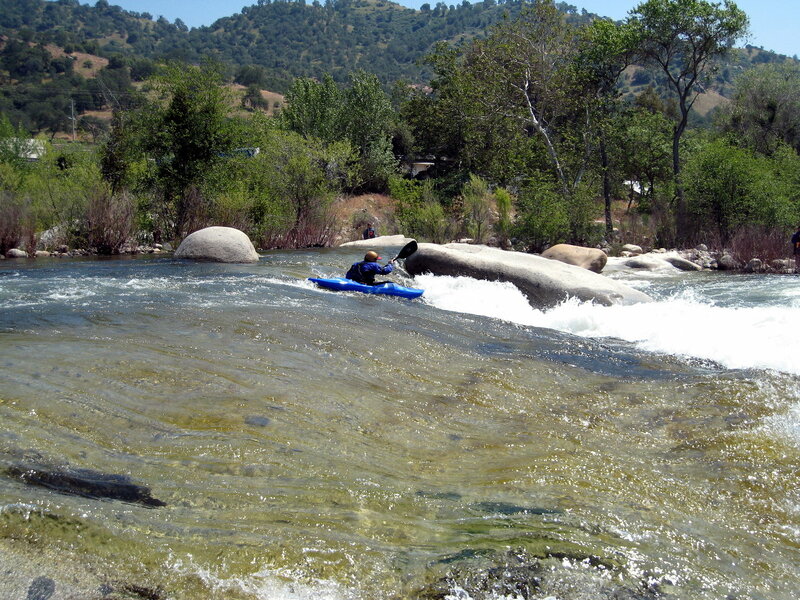 To find nearby food and lodging, type Three Rivers CA into the box and click Search.